I wanted to take just a few minutes to introduce myself and explain the intent of this podcast and what you can expect. I became a coach and author to help women find balance in their life because it’s my place of passion. It’s been a struggle for me because I have naturally high cholesterol and I had a crazy stressful job that made it worse. My story is that I wasn’t sure how I felt when the clinical dietician suggested that I become a vegan. I tried it for a few months but it wasn’t the right thing for my body – I was bloated and hungry all the time. I’m always looking for new information or techniques to try to see if it can help me balance those hormones. It can be daunting when a child or partner decides to become a paleo-pescatarian and you don’t know what that means, let alone how to cook for them. As I’m sure you can tell, I love food but what I keep coming back to is that what we eat is only one component of our lifestyle. On top of posting pictures and writing up new recipe ideas, I spend time reading new research on movement, digestion, and stress management – but I thought it would be more interesting to have a conversation than to just talk about it. More importantly, I want to get into things we might be embarrassed to talk about at a restaurant but that you might hear amongst friends in the kitchen over a cup of tea or a glass of wine. 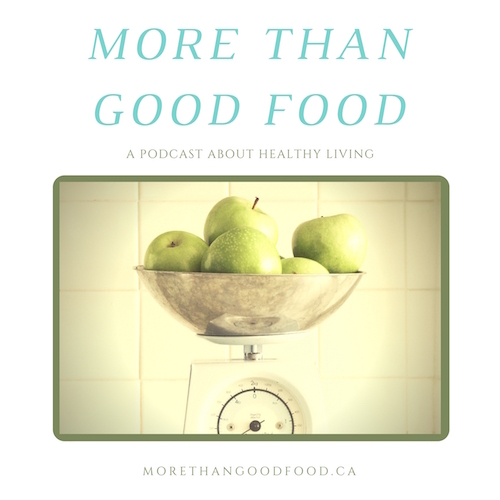 The goal of the More Than Good Food podcast is to have those honest conversations with women who are experts in their field, and those who have lived experience that they want to share, about what it means to live a healthy life in a busy world. Because it’s a conversation, episodes won’t have a specific length but I don’t expect them to be longer than an hour. I’ll be writing up show notes with links to different resources and some of the key points. It will also serve as a place to thank our advertisers and supporters who generously provide opportunities to help offset the costs. My promise to you is that I won’t post anything that I don’t personally recommend and use myself. I look forward to hearing from you in the coming weeks about topics that you want to hear more about. And you get can those at morethangoodfood.ca Please feel free to contact me. You’ll find my email there as well. I hope you will join me next time for a conversation about Getting into the Kitchen for Hot Detox with Julie Daniluk. … and remember that living a healthy life is about About More Than Good Food.